Mega Money Mine Classic Slot Guide & Review - Casino Answers! 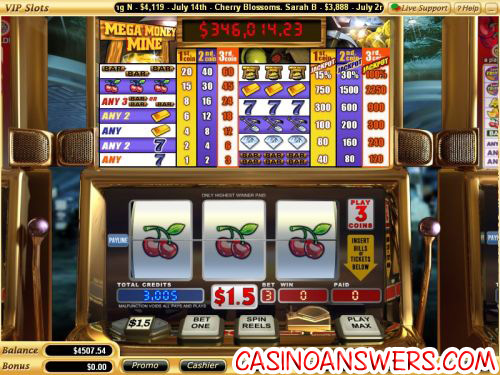 Mega Money Mine is a 3-reel, 1-line classic slot machine developed by Vegas Technology, featuring a progressive jackpot. You can play the Mega Money Mine progressive jackpot slot machine at US-friendly casinos Go Casino and Silver Dollar Casino. Mega Money Mine has a fixed coin size of $1.50 per coin. To be eligible for the entire progressive jackpot, you must play all 3 coins, which totals $4.50 per spin. Hit the “Play Max” button to play for the progressive jackpot or hit “Bet One” the appropriate number of times followed by the “Spin Reels” button to play one or two coins. Casino Answers strongly recommends playing the maximum bet on all spins on Mega Money Mine, as you don’t want to regret winning only part that progressive jackpot. Mega Money Mine is a little different from other progressive jackpot slots in that you don’t need to play the maximum bet to be eligible for a piece of the progressive jackpot. On 1 coin spins ($1.50), you can play for 15% of the progressive jackpot. On 2 coin spins ($3), you can play for 30% of the progressive jackpot. However, if you click “Play Max” and play 3 coins on Mega Money Mine, you can play for 100% of the progressive jackpot. At the moment, the Mega Money Mine progressive jackpot is at just over $346,000, making it larger than most other progressive jackpots in the online casino world. You can win the Mega Money Mine progressive jackpot when you play now at Go Casino! There are 13 winning combinations on the Mega Money Mine progressive jackpot slot. The full payout schedule is as follows (1/2/3 coin payouts in parenthesis): 1 Seven symbol (1/2/3), 2 Seven symbols (2/4/6), 1 Gold Bar symbol (4/8/12), 2 Gold Bar symbols (6/12/18), any 3 Bar symbols (8/16/24), 3 Cherry symbols (15/30/45), 3 Single Bar symbols (20/40/60), 3 Double Bar symbols (40/80/120), 3 Diamond symbols (80/160/240), 3 Mining Tools symbols (100/200/300), 3 Seven symbols (300/600/900), 3 Gold Bar symbols (750/1500/2250) and 3 Mega Money Mine symbols (15% jackpot/30% jackpot/100% jackpot). Mega Money Mine not only has a mega progressive jackpot, but also 13 different possible winning combinations. The whole point of playing the slot game is to win the big jackpot, but you can also get some nice smaller wins along the way. Try and win the Mega Money Mine progressive jackpot today by signing up at Go Casino! How can I win the Mega Money Mine progressive jackpot? It may be easier said than done, but all you have to do to win this progressive jackpot is hit three Mega Money symbols on the single center payline. You have to be making the maximum bet spin of 3 coins to win the entire progressive jackpot. Are players from the United States of America eligible to win the Mega Money Mine jackpot? Absolutely! USA players are welcome to sign up, deposit and play all of the excellent casino games at every Vegas Tech online casino, including Go Casino and Silver Dollar Casino. Can I play a free Flash game of the Mega Money Mine progressive jackpot slot? You can use the Instant Play Flash casino at Go Flash Casino or Silver Dollar Flash Casino to play the Mega Money Mine classic slot for real money. If you experience any issues with the Flash casino software, make sure you have the latest version of Adobe Flash Player. Can I play the Mega Money Mine progressive slot in practice play? Unfortunately, Vegas Tech does not allow for players to play their progressive slots in practice play for free. What are the other progressive jackpot slots available at Vegas Tech casinos? You can play Red, White and Win, Treasure Trail, Win Place or Show or Pay Dirt at Go Casino and Silver Dollar Casino, which are both USA-friendly casinos.